I was lying in bed thinking about the difference between a writer and an author. I pondered which I was. I enjoy writing. I love writing. So much so that I continue to write without backtracking to edit and revise a piece. Currently, I have over 30 pieces, a compilation of short stories, flash fiction and essays. I have a rough draft of a novel; a memoir of my life. I have the beginnings of another memoir revolving around my mother’s dementia. I have a completed poetry collection, already edited, and just needing minor re-organization and categorization. Some short stories and flash fiction pieces have been posted on my website. Others, I have waiting patiently for me to decide what to do with them. I had an idea a couple years ago to keep the remaining short stories, edit and revise them, and publish them as a collection. My mind tells me, “Writers write. Authors are writers who write for the purpose of publishing.” Am I an author because I’ve published on my own website? Is the identify of “author” only for those who’ve published books? Am I a writer who’s simply a blogger? Who really cares? I know I have more than the aforementioned books in me. I lack motivation to publish. I enjoy writing so much I prefer to simply write and, therefore, don’t necessarily feel the need for my work to be read. 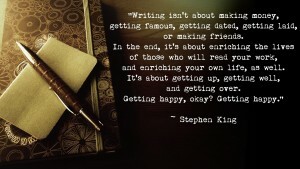 I know authors who write solely for the purpose of publishing and wanting to be known, seen, and have their work read. Do you consider yourself a writer or an author, and why? Do those identifiers mean the same thing to you? Why do you write i.e. for the love of writing or for your work to be read? I look forward to reading your thoughts. Whichever you are … be your authentic self. Subscribe for automatic notification of new posts and share this website and article with others. Thanks!